Messrs. Brattain, Shockley, and Bardeen, are credited with inventing the first working transistor per their announcement in December of 1947. This article provides what was for many people an introduction to the operational specifics of transistors. 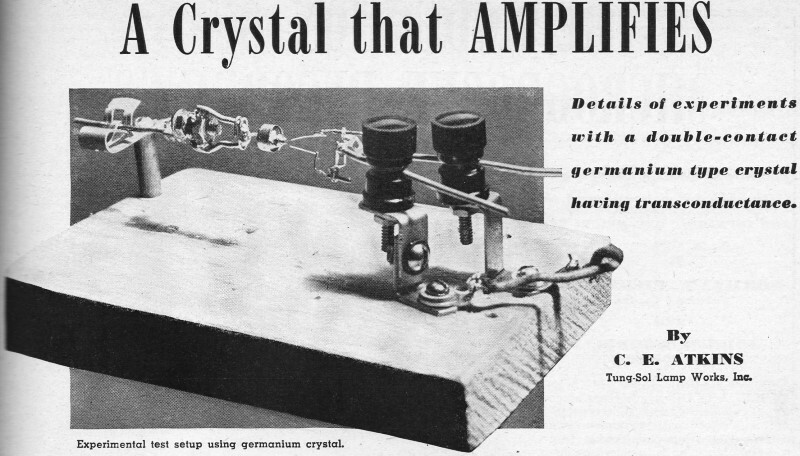 Although its crude point contact ('cat's whisker') emitter and collector arrangement against the doped germanium base element was still in a configuration that did not yet represent a significant challenge to the domain of vacuum tubes, people of vision recognized its superior potential. As with most technologies, progress occurred quickly and within a year the first commercial transistor was on the market. C.E. Atkins, a frequent author in Radio & Television News magazine, related this story of his own attempts to develop a transistor and offers the opinion that transistor might indeed someday replace tubes as amplifiers, oscillators, and frequency converters. Details of experiments with a double-contact germanium type crystal having transconductance. Bell Telephone Laboratories' recent announcement of a new electronic component - the "Transistor" has started many "back of the shop" experiments. Like any other new design, complete technical details on the product are withheld for a time. In view of this we believe it to be appropriate to publish this report of an independent experiment that was, however, suggested by the announcement of the "Transistor" - Editor. Rumors of a recent sensational development in crystal transducers led the writer to explore a field he had not touched since the early 1920's. Like thousands of other boys, he built the usual crystal receivers and tinkered endlessly with "cat-whiskers" and coils. The very words "silicon" and' "galena" evoke nostalgia for the halcyon days now, alas, so rapidly receding into a dim and remote era. Even in that day the electron tube had largely supplanted the crystal detector, once the mainstay of wireless reception. In addition to its role as a detector, amplification and oscillation were also attempted without much success. Radio News in 1923 carried articles on the Zincite crystal, wherein feeble oscillations were developed because of a small negative resistance exhibited under certain rather critical conditions. This was elaborated on in further articles in September and October, 1924. This was referred to as the "Crystodyne Principle," a term copyrighted by Radio News. Nothing much came of these developments and with the increasing availability and lower cost of vacuum tubes, crystal devices of this kind were largely relegated to the historical museum. However, during the second World War, vast strides were made in the development of fixed crystal detectors for use in radar where at ultra-high frequencies they were, in many instances, superior to electron tubes. Spurred on by the fragmentary press releases and general trade gossip regarding a three terminal crystal transducer using a germanium crystal, the writer undertook the fabrication of such a device himself. A 1N34 crystal diode was procured and used as the source of a ready mounted germanium crystal. By holding the 1N34 with a pair of long-nosed pliers gripping the cathode or negative lead (which is clearly marked) the crystal may be exposed by chopping the ceramic adjacent the metal cap at the negative end with side-cutters. The ceramic will shatter, and there is a brass stud inside against which the cutting force expends itself. The germanium crystal is mounted on the stud and, with ordinary care and good fortune, it is possible to strip the ceramic away without impairing the crystal. Fig. 1. (A) Voltage-current characteristics of a single cat-whisker for two different positions (a and b) on a germanium crystal. (B) Detail of (A) in the region of the elbow to show high conductance characteristic in the forward direction. The writer's attempts to utilize the cat-whisker used with the 1N34 were unsuccessful, so this part of the assembly was discarded. Workable cat-whiskers can be made from the heater wire of almost any 150 ma. radio tube. The tubes can be defective for almost any cause - even heater failure, if in the right place. The average radio shop generally has many of these at hand. The writer used type 35W4 because several defective ones were currently available. By breaking the glass bulb and clipping the support leads to all elements except the heater, it is possible in most cases to slide the heater out of the cathode sleeve. The structure can be further disassembled by gripping one of the base pins with a pair of long-nosed pliers while all the glass around the pin is chipped away with side-cutters. One then has a base pin and lead welded to a segment of coated heater wire. It is necessary to leave the ceramic coating on the heater wire in order to give it sufficient rigidity. It may be trimmed to suitable length with a small pair of sharp scissors and a short tip (say one-sixteenth or one-thirty-second of an inch) of bare wire can be exposed by gently and adroitly crushing the ceramic coating with a small pair of tweezers. It is advisable to prepare several of these cat-whiskers, inasmuch as they are quite fragile and several may be needed before a workable device is obtained. As the photograph shows, the experimental assembly is mounted on a block of wood approximately 5 1/2" x 3 1/2" x 3/4". The lead from the germanium crystal mounting is saddled onto a brass nut in such a way that this assembly will turn concentrically about a 6-32 machine screw. The machine screw, in turn, is bolted to a soldering lug bent at right angles and soldered to a piece of No. 16 tinned bus wire. As can be seen from the photograph, the wire is held by a Fahnestock clip mounted on the wood block with a wood screw and spacer. This crude but effective arrangement facilitates adjustment of the crystal transducer. Two cat-whiskers are brought to bear on the crystal surface. Clips, extracted from a wafer type miniature socket by cutting the bakelite away, are soldered to short lengths of No. 16 tinned bus wire. These wires slide into binding posts mounted on brackets by means of which electrical connections and a measure of adjustment are obtained. Since the cat-whiskers were prepared attached to the radio tube pins, they can be readily fitted into the socket clips. After suitable forming with tweezers or small pliers and the exercise of considerable cautious diligence, two cat-whiskers may be brought to bear upon the surface of the crystal. They should engage the crystal with a light pressure and should be as close together as feasible without contacting each other (the separation is only a few thousandths of an inch at most). A magnifying glass is essential and considerable juggling artistry must be exercised before good characteristics are obtained. Fig. 1 shows a voltage current characteristic of a single cat-whisker (either one of them). It has the shape typical of a barrier type rectifier. The curves a and b are from data for different cat-whisker settings. Fig. 1B is a detail of Fig. 1A in the region of the elbow in order to show with greater clarity the high conductance characteristic in the forward direction. This data indicates that in the forward direction the impedance is approximately 100 ohms, while in the backward direction it is approximately 3000 ohms. These curves are typical of many taken. 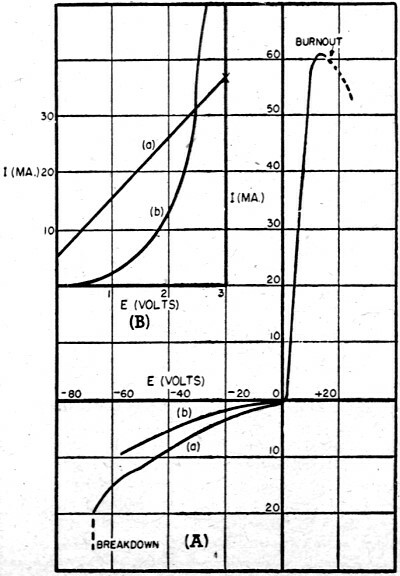 In the backward direction voltage breakdown is likely to occur at above 50v, while in the forward direction burnout takes place in the neighborhood of 60 or 70 ma. Fig. 2. Two curves relating the transfer or control parameters of the device. Fig. 2 shows two curves relating the transfer or control parameters of the device. With a back voltage of approximately -50v. on one cat-whisker, the control effect on current to this cat-whisker of the application of small forward potentials to the other cat-whisker is shown. Curve a, indicating a transconductance of 15,000, was about the best the writer was able to do. 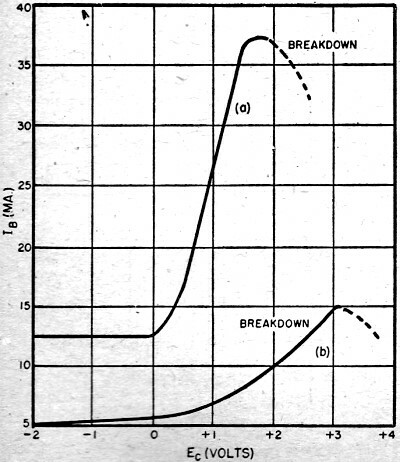 Characteristics of the order shown by curve b are more readily obtainable. As Fig. 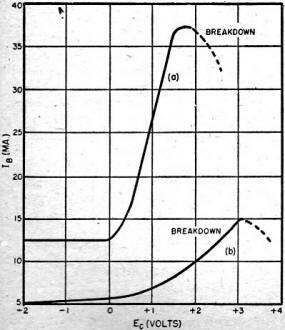 1 indicates, small forward potentials on the cat-whisker result in rather substantial forward current so that unlike typical vacuum tube operation the input electrode does require appreciable amounts of power for control purposes. However, since the output electrode potential is much higher than the control electrode potential, a favorable ratio of controlled power to controlling power may result even in cases where the input current is actually greater than the output current! The writer's nomenclature designates the output circuit as the "B" circuit, while that associated with the control cat-whisker is called "C" circuit. This is in rough accord with ancient usage. Fig. 3A is a schematic diagram of a test circuit for measurements of amplication with the three terminal crystal and for obtaining the data of the foregoing characteristic curves. Since the control electrode impedance is only about 100 ohms, a stepdown transformer is needed to couple a signal into the device. The d.c. resistance of the transformer secondary is only a few ohms and its effect on input circuit current is negligible. The output load resistor RL can be shorted out while data for the static characteristics is taken, although it is generally advisable to have a hundred ohms or so at this point in order to prevent runaway at high current levels. In fact, the writer's data set forth in Figs. 1 and 2 is in error to the extent of the IR drop in a protective resistor in series with the "B" circuit. The best conditions the writer has so far managed resulted in a change of 15 ma. Ip at -50v. Eb with a control potential change of +1v. at 15 ma. This is a power ratio of 50 to 1. Unfortunately this condition was very unstable. More reliable and more readily obtainable adjustments gave power ratios of approximately 15 to 1. As an amplifier, a load of 500 ohms seemed to give the best results even though the curves apparently call for 1500 ohms or more. A typical favorable adjustment of the cat-whiskers gave a maximum power output of 200 mw. at Eb -40v., Ib 22 ma. 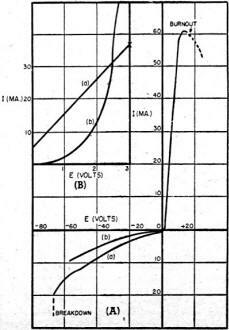 (B power .88 watts), a C bias of + 2.0v. and rectified Ic of 15 ma. ("C" circuit standby power 30 mw.) a likely a.c. input power of approximately 22 mw., giving a power gain of 10 to 1. The small positive bias on the input cat-whisker is necessary for relative linearity in output current. The waveform looked reasonably good on an oscilloscope and the response was constant from 20 cycles to 30,000 cycles. Substantial voltage amplification should be possible, if the resistor RL is replaced by a properly designed' step-up transformer. Fig. 3. (A). 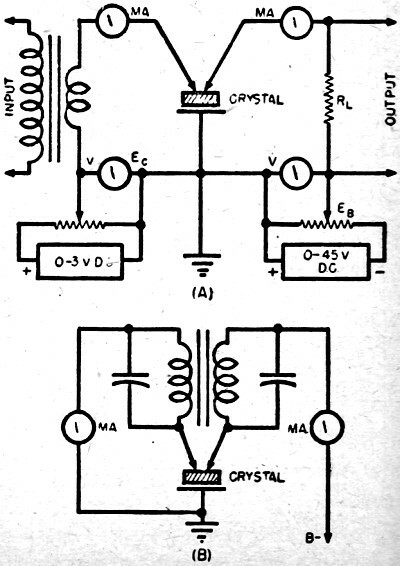 Schematic diagram of test circuit used for measurements of amplification with the three-terminal crystal and for obtaining data of curves of Fig. 2. 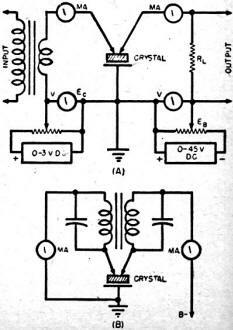 (B) Circuit diagram of an oscillator using double cat-whisker germanium crystal. Fig. 3B is a circuit diagram of an oscillator using the double cat-whisker germanium crystal. A 15v. r.m.s. signal was developed across either of the tank circuits at frequencies from 20 to 100 kc. depending upon the L-C ratio. Eb was -35v., Ib 4 ma., Ic 1.5 ma. and Ec, probably around -1.5v. due to the d.c. resistance of the transformer winding. These figures are considerably different than the amplifier case. The oscillatory condition apparently has a marked influence on the behavior of the crystal. The writer has not as yet succeeded in operating the double contact crystal at high frequencies but expects to do so at a later date. Why does the device function as it does? An exact answer is doubtless couched in terms of mathematical physics. Any purely verbal description is likely to be a generalized approximation at best. Barrier rectifier characteristics stem from the fact that when dissimilar metals are extremely close together without actually touching (100 atomic diameters or so) electrons from the more electropositive metal, i.e., the one with the lowest work function, spill over into the other metal. That is to say, they actually jump the barrier. Enough of them will do this and equilibrium is established when a back-potential equal to the difference in work functions of the two metals is reached. If a positive external potential is applied to absorb the electrons across the barrier the process continues and a current can flow in the "forward" direction. A potential in the reverse direction, however, results in but little current since electrons merely pile up at the barrier unless, of course, the potential difference is great enough for breakdown. In the case of the germanium crystal and the tungsten contact a suitable barrier is supplied, as it were, by the atomic structure of the germanium crystal because it is a certain type of semi-conductor. As Fig. 1 indicates, electrons pass through the junction more readily in one direction than the other. If a back voltage is applied to such a germanium-tungsten junction and a second tungsten cat-whisker is positioned very close to the first one with a small forward potential applied to it the equilibrium conditions are upset and it is possible for electrons to flow from the first cat-whisker in spite of the backward potential. What good is it? Prophesy is always hazardous, but it would seem that devices of this kind might certainly supplant vacuum tubes as oscillators, amplifiers, and frequency converters in many applications. While the writer's working model is admittedly crude - one could not sneeze in the same room without substantially altering its characteristics - one can readily see how the necessary mechanical and electrical refinements might be worked out as in all likelihood is already the case. New components and new circuit techniques must of course be developed to use them in radio, television, and industrial electronics.